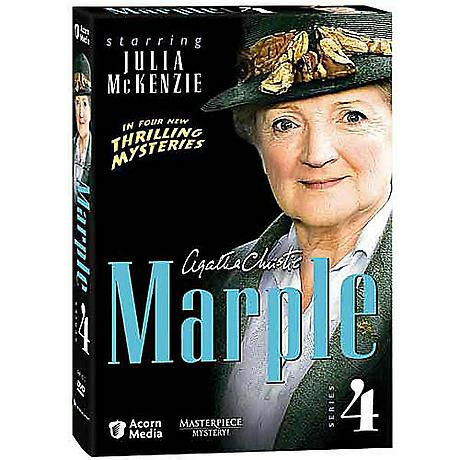 Donning the trademark tweeds as if they were made for her, the marvelous Julia McKenzie (Cranford, Notes on a Scandal) assumes the Marple mantle in four gripping new adaptations of Christie mysteries. With her ladylike manners and modest appearance, Dame Agatha's spinster sleuth blends into the background of fashionable society. However, her razor-sharp mind and no-nonsense view of human nature make her a formidable foe to evildoers, cracking the cases that even the professionals can't solve. Picturesque English scenery, grand estates, witty scripts, and lavish post-WWII period detail provide the perfect frame for "frighteningly fun mysteries" (Entertainment Weekly). The stellar supporting cast includes Matthew Macfadyen, Rupert Graves, Anna Chancellor, Jemma Redgrave, Helen Baxendale, Prunella Scales, Warren Clarke, Natalie Dormer, Rafe Spall, Kenneth Cranham, Samantha Bond, and Joan Collins. "Totally, unexpectedly fun" --E! Online. 4 episodes; approx. 372 minutes on 4 DVDs.